You have sent your campaign to your contact list! Now, we will show you how you can share your newsletter on social networks or your website for everyone to see it. To share your campaign, go to the "Campaigns", then click "Campaigns" again in the left sidebar. 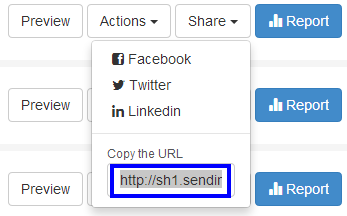 Where your sent campaigns are listed, click the "Actions" button and select "Share". You will then have the option to share the newsletters on your Facebook, Twitter and LinkedIn account; or copy and paste a link to put on your website. All you need to do now is choose where to share your newsletter!